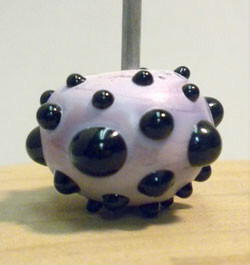 This pink beadmade from Effettre glass has black polks dots and loads of texture. Made by Karen Kubby at Beadology Iowa. The fun beads are bright in color and spiky in texture. Please let us know if you want the pea green with orange, orange with pea green, or the set.These are priced individually. Made by Karen Kubby at Beadology Iowa. 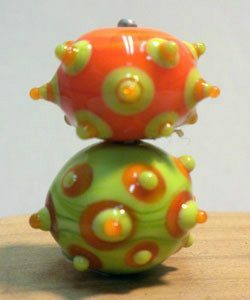 Using a transparent color on a transparent color and slightly melting in the dots causes a beautiful, yet false sense of movement in the glass. Made by Karen Kubby at Beadology Iowa. 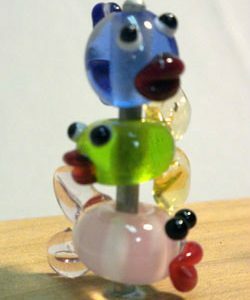 These fish beads are adorable. They come in transparent blue, transparent yellow, transparent red, opaque pink, opaque turquoise, and opaque orange. They make great earrings! 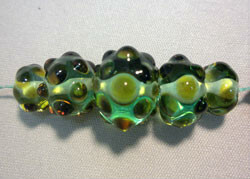 Made by Joyce Berg, who works in the flamework studio in our Bead Lab. This set of pink beads with black polka dot beads from Effettre glass is a classic. 2 of the beads have their dots melted in for a smooth surface; the other 3 are left a bit bumpy. Made by Karen Kubby at Beadology Iowa.